Prior to the Spanish colonization of the Americas and introduction of Christianity, celebrations dedicated to deceased ancestors were observed in summer and lasted for a whole month. On this day, people worshiped the goddess known as the Lady of the Dead. Over the years, the image of the goddess transformed into La Calavera Catrina, a female skeleton that has become the icon of the Day of the Dead. Eventually, the festival was moved to November to coincide with the Roman Catholic holidays that commemorate the deceased. However, some ancient traditions have been preserved. For example, many Mexicans built private altars (ofrendas) for the deceased. These altars typically contain the favorite foods and beverages of the departed, sugars skulls, photos, memorabilia, and Mexican marigolds. It is also customary to visit cemeteries in order to clean and decorate the graves. 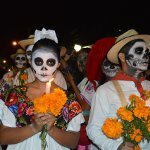 In Mexico, the Day of the Dead is a public holiday. It is also celebrated unofficially in some Hispanic countries with large Hispanic population. In 2008, UNESCO included the holiday into the Representative List of the Intangible Cultural Heritage of Humanity.